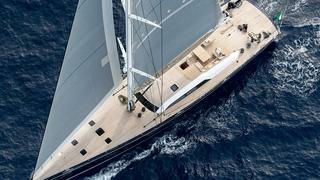 When a world-famous yacht builder like Nautor’s Swan debuts a new model, the sailing world pays heed. It’s especially true when this launch is its biggest current production model and the second largest yacht it has ever built – for company chairman Leonardo Ferragamo, no less. 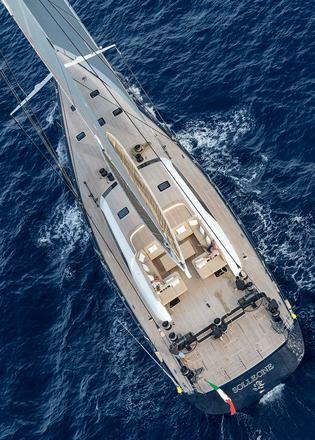 Add to the equation Germán Frers as the naval architect of the all-carbon vessel and it is clear that 35.2 metre Solleone is a truly noteworthy newcomer. Does she live up to expectations? I’m on the Côte d’Azur to find out. The first test of a yacht’s potential success is its appearance and Nautor’s Swan has always understood that owners must be able to take pride in their boats. Solleone – whose name combines the owner’s and two of his children’s names but also suggests summer heat – certainly fulfils this ambition. Her low silhouette, near-vertical bow, wide stern, broad beam and high-aspect ratio rig create the very image of a modern high-performance yacht. 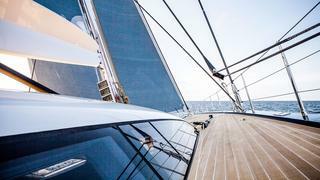 In fact, with her carbon rig sporting twin masthead backstays as well as runners, and a “fat head” North 3Di mainsail slab-reefed on to her Park Avenue-style boom, Solleone could well be mistaken for a new generation racer. But this is Nautor’s 115 S cruising version, as opposed to the yet-to-be-launched race-oriented 115 FD, which has only a low blister of coachroof rising from an otherwise flush deck. Both of these elegant variants pass the beauty test with flying colours. Another necessity for a yacht of this stature to be successful is that it must sail like a true thoroughbred. Few Swans have ever failed this test, so when I join Solleone in Villefranche, I have high expectations, despite the sub 10-knot wind forecast. 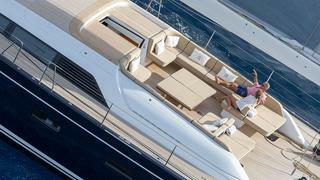 Moored alongside Solleone is Ferragamo’s previous Swan 90 S. It is readily apparent that the deck layout of the new 35.2 metre owes much to the smaller model. 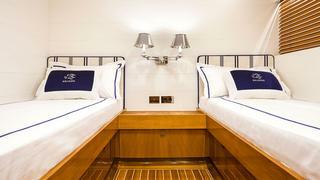 Both sport ultra-clear foredecks, a well-organised area around the foot of the mast, guest cockpits set behind the low rise of the coachroof and helm stations sunk on a slightly lower deck level further aft. I begin to grasp the yacht’s simplicity of operation as soon as we motor out of the harbour and raise the sails. Despite her length and cruising appellation, Solleone has no push-button captive winches for sail handling. Three huge Harken drum winches, positioned on either side of the sailing cockpit, handle the jib, staysail and asymmetric spinnaker, while the main – tacked down to a single point on the centerline – is tailed on a seventh winch, centrally positioned between the helm stations on the higher deck level. The North 3Di main works with the perfection of an aircraft wing and Solleone soon demonstrates her light-air performance in very able fashion. Immediately, I notice that the helm’s sunken position offers no impediment to visibility forward. 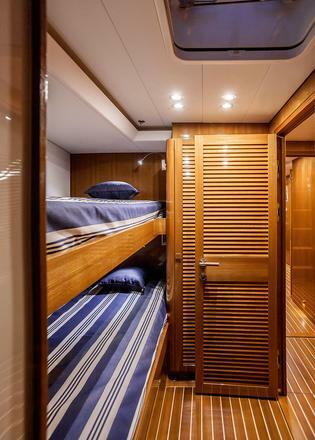 Indeed, because of the low-profile deckhouse, the set-up is better than on many cruising yachts with raised helm positions, and it even offers a modicum of shelter. With the mainsail hoisted and the jib unrolled from a Reckmann furler, our close-hauled speed climbs to 8.2 knots with the true-wind speed reading just 7.5 knots on the mast-mounted B&G 40/40 display, a speed she holds even when reaching with a true-wind angle of 90 degrees. Captain Diego Manuta reports that the best speed he has experienced so far is 25 knots when surfing down a wave off the Portuguese coast under double-reefed main and staysail. Speeds of 14 to 17 knots are commonplace while reaching, he adds. Ferragamo was on that passage, helping deliver the boat from Finland to the Med. “It was raining, it was foggy, the wind was always head-on,” he says. 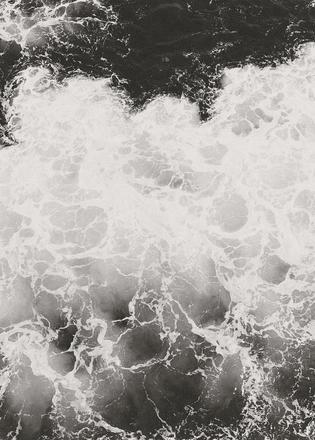 “The waves were not enormous, but they were always there – and from the front. The steering system is entirely manual, with a chain and cable connection linking the wheels to the twin rudders and their quadrants. The small rudder movement required to keep the yacht on course (typically less than four degrees) testifies to the boat’s excellent balance. The helm is light and responsive, and feedback can further be improved by uncoupling the autopilot pistons from the quadrants. Nimble tacking in light-air conditions further demonstrates Solleone’s good breeding. Instead of the standard main with single backstay, Ferragamo opted for an optional “fat head” (usually associated with racing yachts). While it offers a huge mainsail area for the mast’s height, it also requires using twin backstays. The clear advantage of this large sail area is that Solleone sails particularly well in the light breeze of Mediterranean summers, although it requires five people on deck to do a trouble-free tack, in addition to the helmsman. Completing Solleone’s sail arsenal is a staysail that is power-furled on its halyard by means of a roller-head sunk in the foredeck, and an asymmetric spinnaker, raised with the aid of North’s inflatable-mouthed sock that is flown from the bow in winds of up to 20 knots. Certainly Solleone’s attributes will please even the most demanding sailors, but fair-weather types who prefer their yachting paired with a glass of wine and sunshine will be happy, too. The cockpit caters for dinners or cocktails, with adjustable tables that lower to seat-height to produce a huge, cushioned sunbathing area, with more seating facing towards the stern. A bimini, the hydraulically powered skeleton of which rises from a near-invisible locker, shades most of the cockpit. An easy-to-use canvas sunscreen, stiffened by bowed battens, is manually deployed from its stowed position at the front of the structure. Additionally, panels can be fitted to an autonomous dodger that closes off the forward portion for further protection from wind and weather. Across a deck caulked attractively in pale grey (much cooler for bare feet than the traditional black), the stern opens in clamshell fashion to create a huge bathing platform with easy access to the sea. 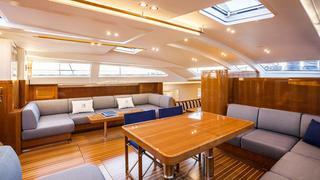 The below-decks spaces benefit from Nautor’s advanced construction techniques that have reduced weight, which allows the designer to add volume. 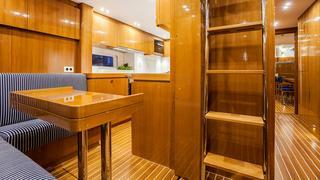 A wide beam carried well aft gives a very spacious interior, which is clearly designed to appeal to owners who have progressed through various sizes of Swan. “I think the interiors are astonishingly beautiful,” says Ferragamo. Florence-based interior designer Michele Bönan has added an Italian twist and sophistication with a high-gloss varnish finish applied to the vertical surfaces. They offer a pleasing contrast with the matt white of the leather deckheads and the satin varnish of the teak-and-holly floor planking. Although solid to the touch and beautifully crafted, it is not pure teak but teak veneer on an ultra-lightweight foam core. Light displacement equates to speed, so savings such as this are important. Throughout, carefully matched luxurious fabrics and linens embellish the effect to create a calm environment. The deck saloon, positioned above the engine room, provides sheltered lounging and dining for up to 12 guests and good exterior views. 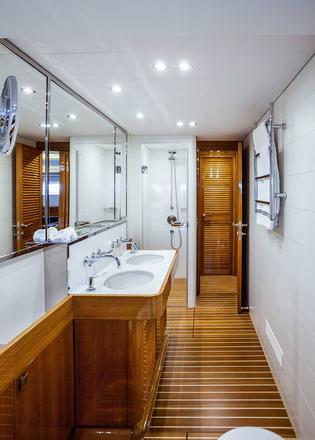 Aft on the lower deck is a supremely comfortable owner’s suite that occupies the whole beam and offers a good lounge area, as well as a shower room incorporating twin basins and a walk-in closet. Just forward are two equally sized cabins with twin beds. 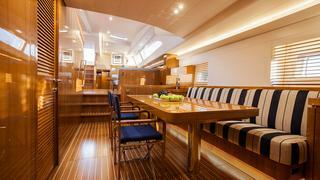 A third guest cabin, this time fitted with a double bed, is forward of the saloon and adjacent to a lower deck saloon/dining area furnished with a settee and teak and canvas campaign-style dining chairs. 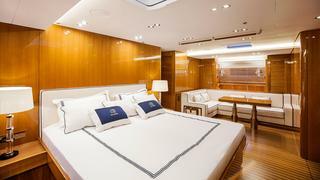 Crew quarters and service areas, including a spacious galley equipped with premium household appliances, a small laundry area and three cabins for a maximum of six crew, fill the bow section. The technical aspects of the Swan 115 S are also very sound. 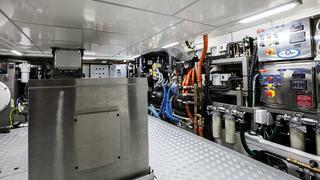 The engine room is ergonomically laid out and neatly assembled around its major components: a 450hp Scania main engine and a pair of Fischer Panda 32kW genets. The propulsion system uses a standard shaft with a Hundested four-blade fully feathering propeller with reverse pitch. An option exists for a fully retracting shaft and propeller, and this system has been taken up on hulls three and four, both more racing oriented. The fact that four yachts of this size were ordered straight from the drawing board must surely confirm this view and promises a great future for this latest Swan, which is sure to live up to the highest expectations of the brand’s enthusiasts.